A hearty welcome and many congratulations to the new College of Commissioners, which was given a resounding approval by the European Parliament yesterday. 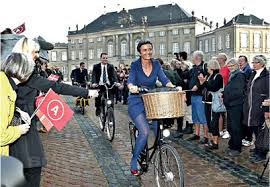 The EUCG is particularly thrilled that the new team includes some dedicated cyclists, such as Margrethe Vestager (pictured – competition) and Violeta Bulc (transport). On their arrival in the most congested city in Europe and North America, they will need no reminding that more cycling and fewer car journeys can provide a boost for health, economic growth and the environment. So good luck. We will be in touch soon.